Christmas came to the Biddle's today. Decorations were going up at the same time turkey was baking and rolls were rising. Of Course we continued the tradition we began when the kids were born - giving them one new ornament each year when we decorate the tree. 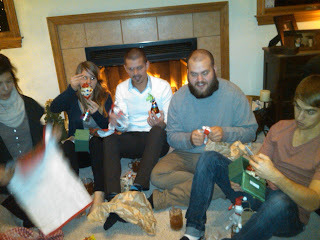 We even had some extras this year. 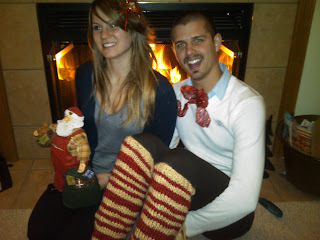 Our son-in-law Aaron was confused about 'hanging' the stockings that Jocelyn just bought for them instead of wearing them! With windows of time becoming less and less with our kids we decided to decorate when everyone was here at the same time. So I guess I can relax in my Christmas-ness and prepare to celebrate for the next month beginning tomorrow! I was wondering when all of you do your decorating? Decorating at the Kelley house begins tomorrow. It usually takes the entire weekend to decorate the entire downstairs......and if the munchkins get their room clean, there will be a tree there, too.